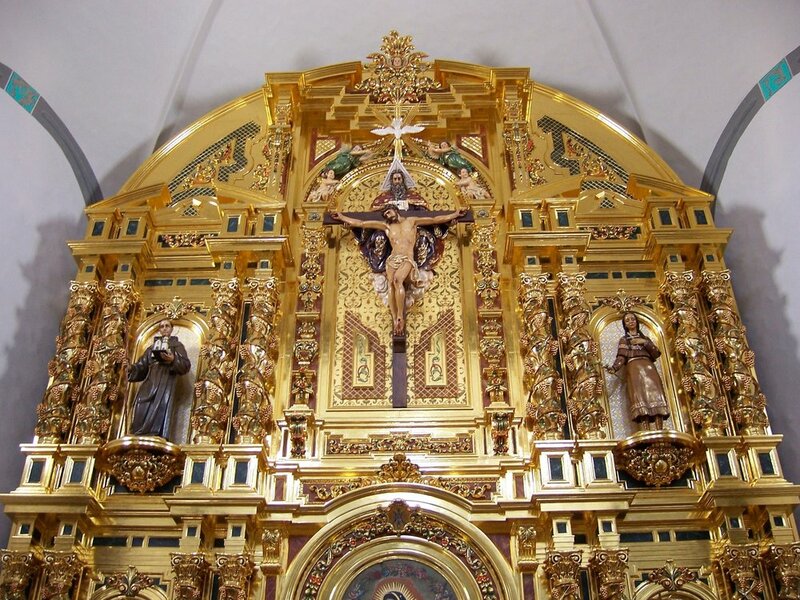 One of the most striking artistic enhancements to Mission Basilica San Juan Capistrano in recent years was the installation of a monumental Retablo or Reredos, positioned in the Apse of the Basilica Church. The historic Mission, founded on November 1, 1776, as the seventh Mission in the 21 centers of evangelization in Alta California by St. Junipero Serra himself, is not only a sought after historic destination by pilgrims and tourists from throughout the world, but it is also a thriving multi-ethnic and multi-cultural parish community of over 3000 households. 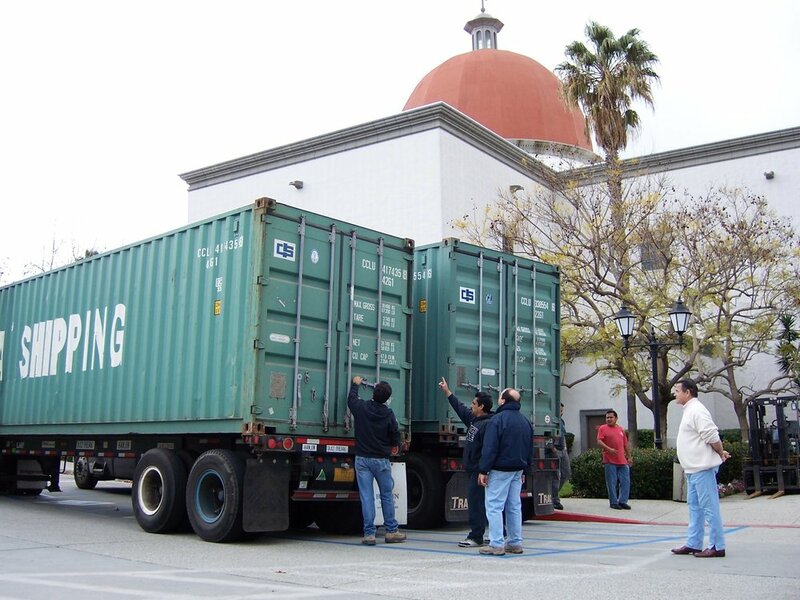 Together with a vibrant Parochial School that was founded in 1921, the Basilica parish continues to serve the spiritual needs of many who visit this hallowed place that enshrines so much of early California history. Modeled after the Great Stone Church that was completed in 1805 and tragically devastated in one of early California’s legendary earthquakes on December 8, 1812, the new Mission Church would accommodate over 700 parishioners and would capture the dramatic vaulted and domed character of its historic predecessor. Completed in 1985 and solemnly dedicated shortly after its completion, the new Mission Church was raised to the dignity of a Minor Basilica by St. John Paul II on February 14 in the Great Jubilee Year 2000. It was later designated a National Shrine by the United States Conference of Catholic Bishops. 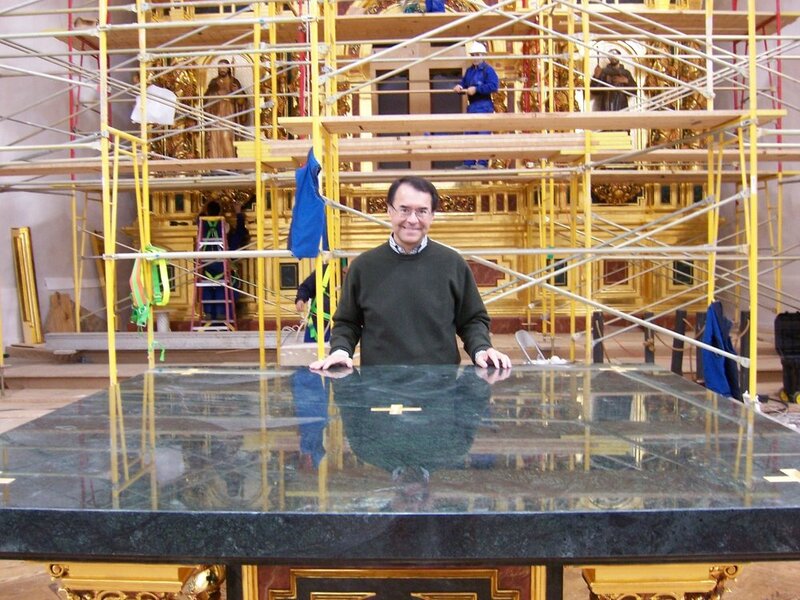 Prior to my arrival as Pastor and Rector in July of 2003, plans were well underway for the ‘completion’ of the interior of the Basilica Church and specifically, the Apsal wall in the sanctuary. Due to significant cost over-runs in the original plans for the Basilica, the interior was left ‘rather modest.’ Plans for a monumental Retablo in the Sanctuary were never able to be realized. Yet, that dream and vision remained very much alive, especially in the hearts and minds of a wonderful couple in the Basilica parish community, Mr. Art and Gaye Birtcher. Unfailing in their generosity to the Mission parish for decades, it was their unremitting passion to see the interior of the Basilica Church completed with its center piece, a Grand Retablo crafted in the style of the great Retablos of the Mission Colonial period. 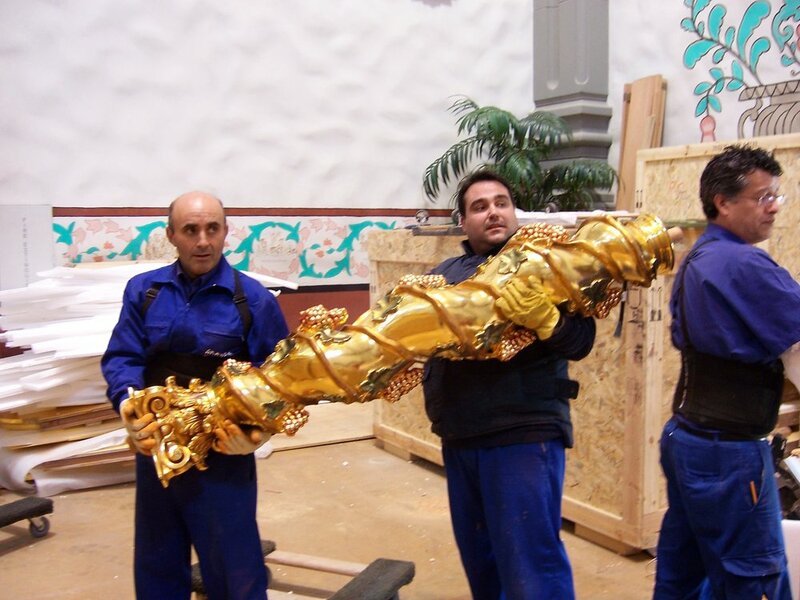 Initial contact had been made with the world renown liturgical artisans at Talleres de Arte Granda in Spain, to do the initial realizations of the Retablo. The designs were subsequently refined to reflect the stylistic approach that was taken by the Catalonian Churriguera family in the latter part of the 17th and early 18th century Spain. It would reflect the exuberance of the Spanish Baroque period at the service of the sacred liturgy. Providentially, as conceptual plans were being completed, the parish was the beneficiary of a wonderful bequest that had been earmarked for the Retablo project. Together with a significant gift from the Birtcher family, funds were in hand to begin this long-awaited project. Construction in Spain took some 15 months. Over 50 craftspeople were involved in realizing this magnificent project. 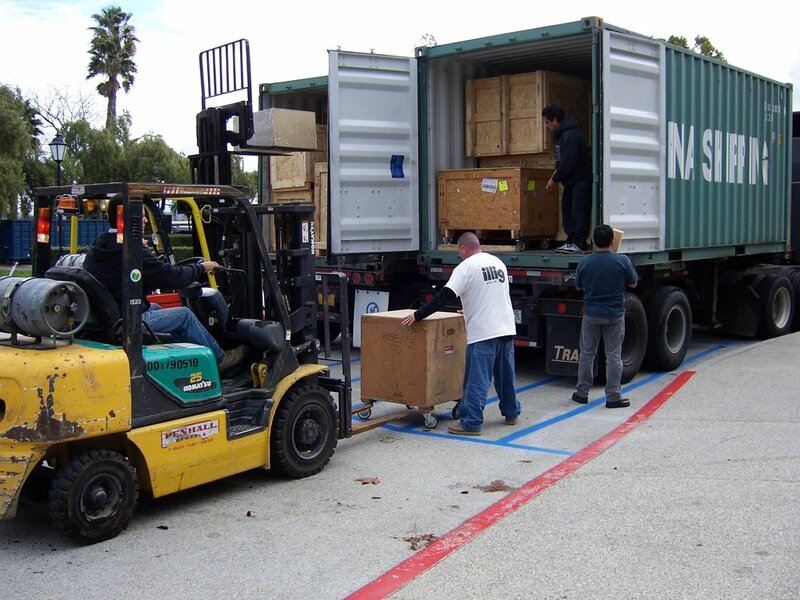 When the Retablo was completed in Spain, it was disassembled and carefully placed into well insulated shipping crates for its journey from the port in Barcelona, through the strait of Gibraltar, across the Atlantic, through the Panama Canal and up the Western Coast of Mexico, finally arriving at the Port of Los Angeles for its final destination to San Juan Capistrano. 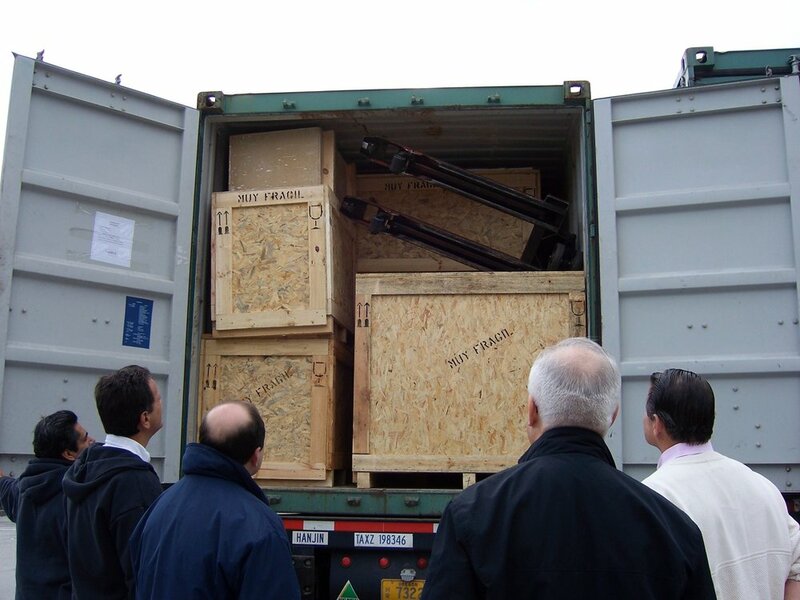 The shipping containers arrived on the Monday before Ash Wednesday in 2007. Granda had flown a number of their skilled craftsmen to reassemble the Retablo in its final home in the Basilica. When the crates were opened and the various pieces of the Retablo were laid out on the transept floor, miraculously, there were only two minor damages – the tip of the right finger of St. Joseph was broken off and one thorn on the crown of thorns of Jesus crucified was broken. Both of these damages were easily repaired. All other pieces of the Retablo arrived in perfect condition. 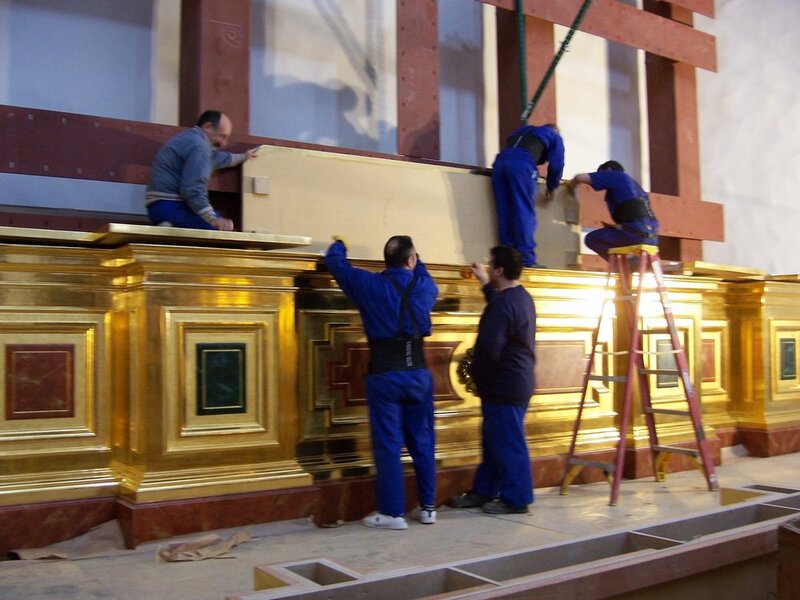 It took the craftsmen two weeks to assemble of various sections of the Retablo onto the steel grid that had been erected prior to its arrival. The steel grid provided the necessary earthquake stability specified by the structural engineers. When the entire Retablo was finally put together, the twin scaffolding was removed to finally reveal the full glory of this magnificent artistic enhancement to the Basilica. 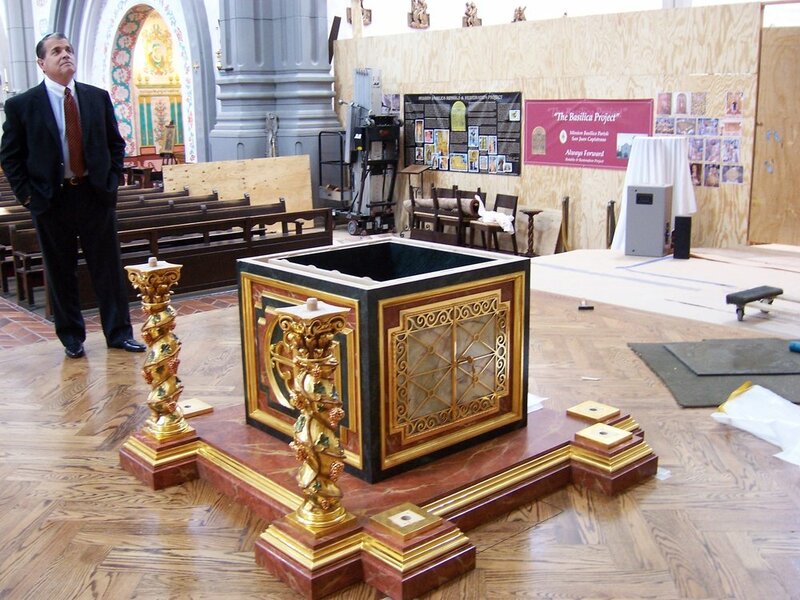 Together with the Retablo, a new altar, ambo and Sacrament Chapel as well as new Stations of the Cross that would be in stylistic continuity with the Retablo, were installed in the Basilica. The first mass celebrated with the completed Retablo was most appropriately that of the Feast of St. Joseph on March 19, 2007. A fanciful element of the Retablo is the incorporation of a number of swallows nestled among its Corinthian columns. Prior to the Blessing of the Retablo and Dedication of the new Altar, a Solemn Evening Prayer Service was held in the Basilica in June, 2007. We were graced with the presence of His Eminence, William Cardinal Levada, who at the time was the Prefect of the Congregation for the Doctrine of the Faith. 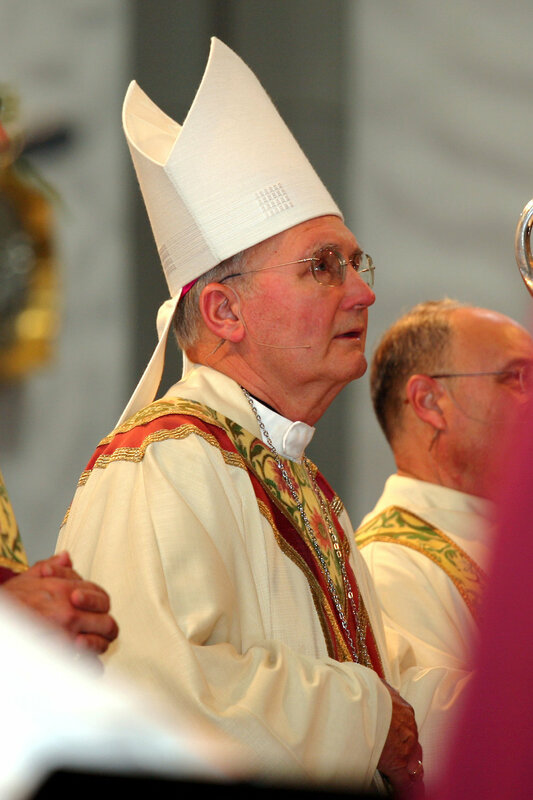 Bishop Tod Brown, the third Bishop of Orange, presided at the Mass of Dedication.